Are you a coach who writes a great coaching blog? Want the world to know how great your blog really is? 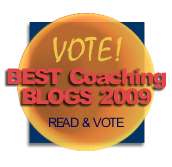 Then the Best Coaching Blogs 2009 Contest was designed for you! Enter your blog for free. This is an awesome way to spread the word about your blog and attract new readers to it. It's also a fantastic way to engage your current readers, by inviting them to vote and give feedback. People love to get involved supporting the folks they believe in and now you can give your readers the opportunity to support you by voting, adding comments (love notes?) to your entry and inviting their friends to come support you, too! Who decides the winners? The people who vote decide! We're using an automated voting system. We do not control who wins, except for one blog, our own. Our blog can be voted on (we want readers and feedback, too! ), but it won't be allowed to win. What will you get if you win? You'll get a badge for your blog and/or website (similar to the one above) that declares you the winner (1st, 2nd, 3rd Place, Top Ten, or Honorable Mention), plus a write up in this blog that includes a few cool comments left by your fans and a permanent link from this site to yours. Plus bragging rights! Why are we doing this? Blogs are a great way to reach out to the world and engage in transformative conversations. And isn't that what coaching is all about? We see this as a cool way to spread those conversations wider and wider and exchange more wisdom with great people. Read more about why coaches should be both reading and writing blogs. When can you start voting? We're targeting May 8th for the date the contest goes live, but nominations start today and will continue through May. Voting ends June 30th and the winners will be announced July 1st! [Update: Vote for your favorite coaching blog here.] Watch for announcements that it's time to vote! Know someone else who should enter the Best Coaching Blogs 2009 Contest? Send them this link to enter: http://tinyurl.com/coaching-blogs Or, use the links above to share with your friends and colleagues on Twitter, Facebook, LinkedIn, StumbleUpon, Digg, etc.